Mera Mann Lyrics (Female) from movie Nautanki Sala is a very sweet and romantic song. 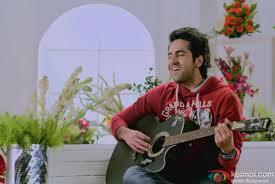 The melodist of Mera Mann song is Tulsi Kumar, where Falak Shabir has wrote the Lyrics of Mera Mann. The composition of Mera Mann is also done by Falak Shabir. Ayushman Khurana, Pooja Salvi and Kunal Roy Kapoor are the main lead of the movie Nautanki Sala. The direction of movie Nautanki Sala is done under the supervision of Rohan Sippy. The movie Nautanki Sala is full of drama and here we are with the lyrics of the romantic song Mera Mann (Female) from Nautanki Sala. We hope you enjoy the Lyrics of Mera Mann (Female) with its correct meaning and complete English Translation. Here you can also watch the Video of Mera Mann from Nautanki Sala. If you have any query about Mera Mann so you can ask through our comment box. Tujhe khud mein chhupa loon, Mahiya! Teri mujh pe nazar ho, Mahiya! Don't go away once you came close..
Let me live in your breaths..
Let me hide you in me, o love! Your eyes on me, o love! Come in to my arms..